* Dinner package includes a side salad, any entree on the menu, a non-alcoholic drink, a reserved seat in the front section, tax & gratuity. Hitting the comedy club stage at nineteen is not the best way to succeed in life. Every turn has to work or you end up on an off ramp holding a “Will work for food” Sign. Christopher Titus never stopped working at bringing the funny. In the twenty years he has performed he has headlined comedy clubs around the country, written, starred and executive produced a hit TV show, and is one of the few comics ever to have a ninety minute comedy special air on two different networks. Christopher Titus has never shied away from subject matter. In his first stand up show,”Norman Rockwell is bleeding” he destroyed the Hallmark card definition of family and brought it into a real place. The material included in the show covers everything from his mother's mental illness to his father's alcoholism to his ex-girlfriend that used to punch him in the face along with his mother shooting and killing her last husband. Yes, it's funny as hell and can make you shake your head at the same time. “Hard funny is what I go for” Titus says, “It's the kind of joke where you laugh first because you cant help it then you look around to make sure it's OK to laugh. 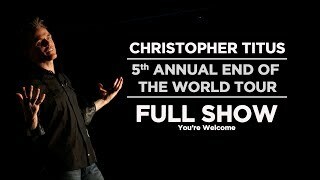 His new one man show Ò The fifth annual end of the world tour. Is a hard funny look at the world since 9/11. My daughter is learning her colors from the terrorist alert rainbow. She thinks Winnie the Pooh is a medium threat. Having a child sixteen days before the nations worst terrorist attack really shook Titus so he wrote a show trying to figure out and solve the worlds problems. From terror to racism to performing for troops overseas Titus pushes the envelope, a harsh, pain-filled envelope that isn't in everyone's mailbox. He just wrapped the pilot for his second half hour comedy. “Special Unit” is “The Shield with handicapped people”. Comedy Central had the guts and the foresight to get behind such an outrageous project. Titus plays a cop who is half Steve McQueen and half Archie Bunker and his job is to train four handicapped undercover detectives. It's wrong and oh so right. To see what Titus is capable of you can get all three seasons of Ò TITUSÓ on DVD. “Norman Rockwell is Bleeding” is available on DVD.